This entry was posted in ClimateBall, Global warming, Policy and tagged Andrew Montford, BBC, Bishop-Hill, Global Warming Policy Foundation, GWPF, The Nine, Youth strike for climate. Bookmark the permalink. "@BBCScotNine ’s decision is directly in contravention of @BBCNews’s own policies." I thought RH simply didn’t know what had happened, rather than him not understanding why people were complaining about this. I’m of the opinion that the MSM and people like Trumpkin use each other to ignite or perpetuate controversies. The History Channel isn’t about history, ditto The Discovery Channel isn’t about discovery. What sells is what is seen ($$$). Follow the money. This tinfoil hat conspiracy theory was bought and paid for by The Flat Earth Society. The climate student strike is a political topic. If the BBC would have him on to talk politics and pre-tape it to make sure he does, it would be okay to have Andrew Montford on. I would still wonder whether there are not more interesting and knowledgeable guest to represent that world view. Yes, I agree that if you were simply discussing politics, then having Andrew Montford on would be fine. Well, apart from there almost certainly being many potential guests who are far more knowledgeable. The problem may be trying to find one who would suggest that climate change isn’t a problem, we shouldn’t really be doing anything, and that the youth are being brainwashed. It’s astounding isn’t it? My opinion these days is the news media/current affairs is a branch of the entertainment industry only. Perhaps they should just stick to sport 🙂 Quite a number of the right-wing pundits and anti-science propaganda organisations have been triggered by the school climate strike and the publicity it got. Their reaction is to be expected I guess, they consider political propaganda to be their turf. I guess there are two possibilities going on at BBC Scotland. Either they are just ignorant about both the subject and of the BBC’s current policy on ‘balance’ when applied to climate change. Alternatively there’s an editor of the programme in question who holds contrary views about climate change, and no one else in his/her team is questioning his/her decisions. T’would be interesting to know the facts. Maybe the BBC could have some people from the (climate) collapse community on? Could add some balance. They are also full of conspiracy theories that climate science is wrong, it may well be a larger community, but they do not have billionaires and multi-nationals behind them to amplify their voices in the mass media. That cartoon really illustrates something that I find disgusting about the climate activist establishment — conflating serious people like Andrew Montford with members of the Flat Earth Society. You might not agree with what he says (I might not even agree with everything he says), but he’s a very serious and well read on climate and energy issues and what he says deserves a response instead of just being ignored or dismissed. The so-called “Medieval Warm Period” was extremely well represented in medieval annals and other documentary sources and it had come to have at least some impact on the public imagination. So at the start of the 1990s nobody was going to take issue with the story that the IPCC was telling — of Medieval Warm Period giving way to Little Ice Age before another gentle warming was ushered in. But here comes the tension – the origin of Lamb’s sketch was not given. It was more a cartoon than anything. It’s an antique. That work was based on Central England Temperature Record. This was one paper in a single volume of review articles. It would take more than that to overturn an [sic.] well-entrenched paradigm. It However, behind the scenes climatologists were busy, and a short time after the Hughes and Diaz paper was released, the public got a brief glimpse of what was happening. It was not at all as it should have been. These two sentences are interesting for two reasons. The second one shows the tension: The MWP is common knowledge, more than that, it’s a paradigm. And yet is based on antique research, an antique research Hughes and Diaz reviewed, to find something that has the power to shatter that paradigm. Something’s amiss. Maybe it’s just a vocabulary thing. Please note that our neutral Bishop seems to know the distinction between a lichurchur review and innovative research. This distinction will be lost, or so it seems, when telling the tale of the Deming affair. NB – Adapted from this old note. … conflating Andrew Montford with serious people like members of the Flat Earth Society. Now that would be Entertainment Tonight. Deniers debating deniers. Some reviews of the Hockey Stick Illusion are here. Maintaining this level of outrage must be quite tiring. Actually, I’d missed that Canman had complained about the cartoon. I thought some might. what he says deserves a response instead of just being ignored or dismissed. I’m not sure this is really true of anyone, but I’ve seen nothing to suggest that Andrew Montford is serious and very well read on this topic. Since we’re on the topic of cartoons, I can remind people that Andrew Montford posted, on his blog, a cartoon of what was (I think) meant to represent me. It wasn’t wildly flattering. There’s your problem right there: if Matt Ridley is gushing about it and it relates to climate research, you’ve likely done something wrong. Bishop Hill has on several occasions promulgated arguments that the rise in CO2 is natural. That isn’t quite Flat Earth level scientific incompetence, but it isn’t far from it. Close enough that a cartoon (which tend to be deliberately hyperbolic for the purposes of humour) to be reasonable satire. Monford certainly is not well-read on climate if he can fall for a canard like that, as it is specifically addressed in the first IPCC WG1 report. Given the Josh cartoons that Andrew Montford posts on his blog, it’s really hard to see how he could justifiably complain about any cartoon representations of himself (of course, it might not stop him complaining, but it’s hard to see why anyone would take it seriously). @Canman – See the first link in my “Tweet” above for plenty of evidence concerning whether Mr. Montford is “very serious and well read on [Arctic] climate”. Or not. Given the Josh cartoons that Andrew Montford posts on his blog, it’s really hard to see how he could justifiably complain about any cartoon representations of himself. Jim Hunt, you appear to be disputing arcane points about Arctic sea ice with Montford and that’s fine. But this post is about climate people refusing to debate with Montford. FWIW Cook has some talent as a cartoonist, with his Simpsons like style, but his punchline is a rather lame cliche. He’s caricaturing Montford in order to argue for his exclusion from a discussion. The reviews of The Hockey Stick Illusion remind me of a similar punchline, but only in this case, it’s brilliant. The title of Steve McIntyre’s post on the Real Climate review says it all — The Team Defends Paleo-Phrenology. The comment section of that Real Climate review is the most amazing example of people invested in a narrative, trying to convince others and themselves that utter crap is science. Our Beloved Bishop’s Dossier certainly deserves due diligence. For instance, it is claimed that “Lindzen of MIT has confirmed that the email was written by Jonathan Overpeck.” But note 12, which follows this claim, points to an Arxiv document authored by Lindzen. There is one mention to Overpeck in that document: a signature to an international conference invitation. The only mention of “getting rid” of MWP cites (Deming, 2005) as authority. Here is when the Auditor might revive yet another introduction to check-kiting. > But this post is about climate people refusing to debate with [our Beloved Bishop]. You’re injecting your own editorial comment into your identification of the topic, Canman. The topic is the BBC’s AGW coverage. AT’s point is that it lacks balance. He argues that inviting our Beloved Bishop shows false balance. Recalling that our Beloved Bishop wrote a policital hit job does not counter that. Switching to freeze peaches won’t work either. Realclimate isn’t the only review. Also, John Cook’s cartoon wasn’t about Montford specifically. I simply chose it as a hyperbolic representation of the situation. This isn’t really about debating Andrew Montford (I don’t think I’ve ever encountered Andrew Montford engaging in anything resembling a debate) it’s about the mainstream media giving undue credence to fringe views. I find it quite remarkable that a vaste majority of those who appear on the BBC and dispute the seriousness of AGW are associated with the Global Warming Policy Foundation. Why should one organisation get so much coverage? (i) as I pointed out, Monford has questioned fundamental issues with arguments that only basic scientific literacy is required to see are obviously false. (ii) I don’t think anyone is arguing for exclusion, just against false balance. Having said which, it seems scraping the barrel to resort to Montford. (iii) Science isn’t decided by debate (ask Darwin why not). (iv) Re “The Hockey Stick Illusion” subsequent paleoclimate reconstructions have confirmed the “Hockey Stick” using different, improved methodologies. This suggests it isn’t an “illusion”. Does that not give you food for thought? If Andrew Montford really wanted to engage in serious discussion/debate about the topic, then he probably shouldn’t have written a book called the Hockey Stick *Illusion*, written a blog that promoted anything that disputed AGW (either its seriousness or its existence), and become Deputy Director of an organisation that promotes any old nonsense about climate science. If he objects to cartoonish caricatures then he probably shouldn’t have regularly published Josh’s cartoons (the latest one of which targets a teenager). > This suggests it isn’t an “illusion”. Does that not give you food for thought? If this could not turn into yet another #ButMBH, that’d be great. The Beeb. Its AGW coverage. Why our Beloved Bishop. Why the GWPF in general. These are the entry points. It is a data point on the suitability of Mountford as a “serious person”. There is really no level Josh and Bishop will not go below. Disgusting. The Real Climate review of HSI is not the only review. IMO it’s a desperate attempt to paper over really bad science. Alastair McIntosh’s review is much better. It starts out with a pretty good descriptive summary, but then he buys into all the high sounding rhetoric from the climate establishment side. I think that the following quote, from Bishop, is a fair window into his suitability as an expert when talking about climate science. This was in response to him being questioned (by Richard Betts) about making contradictory statements, one which pretty much every one agrees is just wrong, the other which is probably just wrong if not just wrong. Re temperature trends, I don’t carry the figures around in my head – there are better things to put there. The world should be warming at 0.2 per decade, and we haven’t had any warming at all for the last two decades. Those difficult to remember “figures” being something as simple (and highly relevant) as whether there has been any warming or not. I’ve no great interest in discussion the merits of the Hockey Stick. If you don’t like the work done 20 years ago, choose something more recent. (i) You’re presumably referring to an earlier comment where you say Montford’s made claims that the the Keeling curve is not human caused. I’d have to see some examples. (ii) I have a real problem with the concept of “false balance”. Someone has to determine what balance is false. When you have two sides who strongly disagree with each other, why would either side not want to confront and expose the other’s faulty arguments? (III) I think it could be argued that science is a debate, where new arguments defeat and replace old arguments. (iv) “subsequent paleoclimate reconstructions have confirmed the ‘Hockey Stick’ using different, improved methodologies.” That is nothing but a lame talking point meant to paper over the crappy hockey stick science. Its crappyness has nothing to do with subsequent studies. It doesn’t even have anything to do with whether its resulting graphs are correct or not. It was just crappy science. 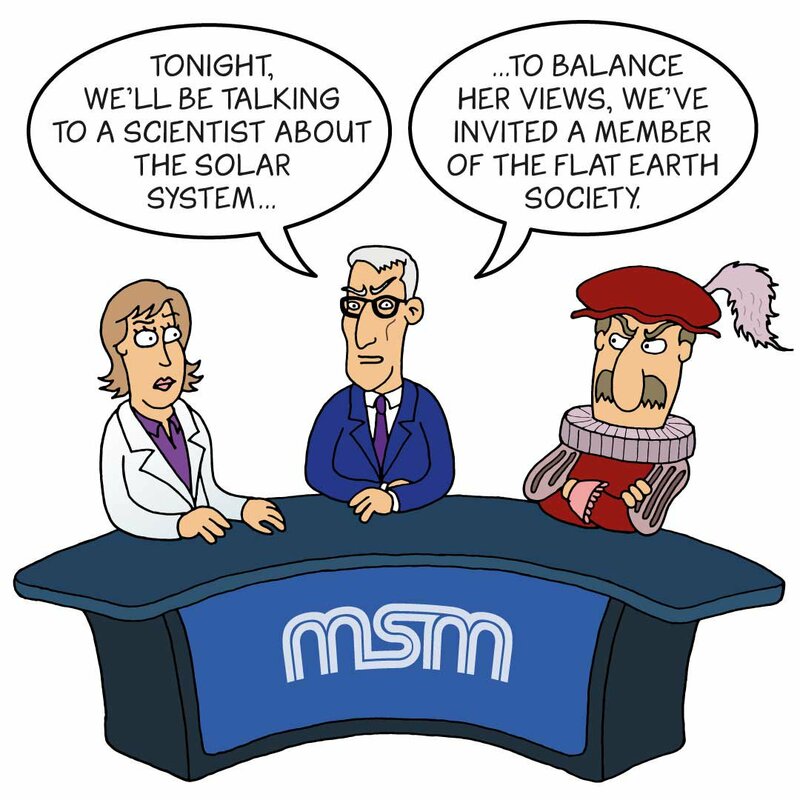 ii) False balance refers to a situation where one “side” is given a platform that far exceeds their representation. When it comes to climate *science* a vaste majority of experts accept the basics that humans are causing global warming and that there are risks associated with our continued emission of CO2 into the atmosphere. The problem isn’t that alternative views are expressed. The problem is when these views are represented far more often than is warranted based on the level of acceptance within the scientific community. iv) The point here is that arguing over a 20 year old study is pointless. Noone thinks it was perfect. It’s not that there is nothing to criticise. The point is that what is suggested has been borne out in subsequent studies. I’m more interested in actually understanding millenial temperatures, than arguing over a paper published more than 20 years ago. (ii) suggesting a parity of skeptic and mainstream scientist is obviously false balance. Wherever the true balance is, it isn’t there. The points have been addressed on multiple occasions – there is no need to have one side trot out the same tired canards again and again whilst ignoring the answers. (iii) It is not a debate though, it isn’t done face to face as being good at rhetoric/oratory means you can win arguments without actually being right. Seriously, see the effect public debates had on the early days of the science of evolution. (iv) “That is nothing but a lame talking point meant to paper over the crappy hockey stick science. err, no. It is science published in journal papers that you cannot refute by merely insulting it. I think you have made my point about debate, rather than actually go and look at the science and point out the errors, you have just used cheap rhetoric. Except you are unlikely to win a debate with rhetoric as weak and transparent as that. and not being able to admit that, and clinging on to criticisms of a long-superceded 20 year old paper, is a sign of not being a “serious person” for a discussion of climate science. Deming had recently created a temperature reconstruction for the last 150 years, based on boreholes in North America. In his study, he concluded that North America had warmed somewhat in the period since 1850, but had little to say bebond that. This was good, solid science but not the stuff of newspaper headlines. Portraying Deming as doing “good, solid science”, immediately before the intriguing portrait of consideration, expectation, storyline, industry, and other institutionalized thought processes and interests. Beloved Bishop is not known to be knowledgeable in borehology. The statement of his opinion regarding Deming’s work deserves due diligence. As the Auditor might ask his readership to ponder: why? Here’s my hypothesis. Our Beloved Bishop is framing the Deming affair as the story between a noble scientist versus global warming industrialists. One (or two, if we count Richard Lindzen) against a powerful multitude. A sudden revelation of tainted intentions. Pure light among the murky shadows of climatology. We can see that defining “good, solid science” is quite secondary. We’re not into the realms of scientific criticism, but more something like scientific opposition research. The way scientific opposition research operates deserves due diligence. Now, why would the Beeb [invite] an opposition researcher? It’s not like he can seek cover under the Auditor’s aura regarding the Deming Affair. The Auditor washed his hands over that old ClimateBall episode after our Stoatness corrected him. Fool me once shame on you. Fool me twice shame on me. Fool me over and over and over again and I’m the BBC and the topic is climate change. Here’s a idea that’s long over due. Behold! the online polygraph!! All the BBC has to do is feed the live closed caption text to the AI polygraph and display the results at the end of each segment. Create a bot from IBM’s project Debater and aim it at some of the biggest climate denier web sites. All responses from the commenters will be fed through the AI polygraph and then fed back to the Debater AI. The Debater will then use the commenters own words to destroy their credibility. You have to admit that whilst this *sounds* good, it doesn’t apply to all subjects for all time. Just for instance, David Icke believes the world is run by shape shifting lizards. Should every politics story have a republican angle, a democratic angle, and a shape shifting lizard angle? In the same way, not every climate story should have a “sceptic” angle. C. S. Lewis was a member of the Flat Earth Society. Consider his fantasy novels. Why this shock over te BBC’s risible coverage of climate change? According to several analyses, it was far and away the most biased, pro-war broadcaster in the western world (yes, even ahead of Fox News if you can believe it) in the lead up to the US-UK invasion of Iraq. Something like 97% of its broadcasts were pro-war. This isn’t balance; this is a travesty. Neocon after neocon was paraded in front of the BEEBs cameras, with one of the highlights for me being their interview with the ‘Angel of Death’ himself, Richard Perle. In their latest book ‘Propaganda Blitz’, David Edwards and David Cromwell at Media Lens take apart BBC coverage on climate change and foreign policy. It is well worth a read. That’s putting it kindly. The last new blog post was in 2017, and new activity is now confined to the ‘Discussion’ area where commenters can start their own threads and which has dwindled down to a small number of the usual suspects (and me, when bored) talking amongst themselves about the Hockey Stick, Watts/McIntyre and the latest FBI/CIA/Clinton/Trump conspiracy theories. Montford seems to have relocated to Twitter, putting out gnomic one-liners. He blocked me on Twitter years ago, so I don’t get to see his gnomic one-liners (apparently I was rude to him, but I don’t really recall being rude to him). In your description of him, you missed one of his best accomplishments — writing The Hockey Stick Illusion. Hahahahaha. Didn’t know you’d taken up satire Canman. hilarious! The illusory hockey stick which was verified by the National Academies and has been shown to be right dozens of times by hundreds of other researchers? That illusory hockey stick? BTW Matt Ridley is not someone you’d want a recommendation from. These days he’s best known for having been asleep at the wheel while chairing the first UK bank to go bust in a century. AT’s I’ve no great interest in discussion the merits of the Hockey Stick may not have been clear enough. Canman is peddling our Beloved Bishop’s hit job. Please stop giving him a hand. Steady on Bish, no need to be rude! I was just a bit surprised that someone who blogs about climate change every day actually admits that he doesn’t have in his head what are arguably the most important figures on the subject – the observed temperature trends. I’d sort of expected that you’d know these numbers as a matter of course, even if you weren’t going on the radio. I’m glad you did acknowledge the existence of the greenhouse effect though (as you always have done). However, I see you’re also now bringing up the old red herring of statistical significance, which you also alluded to on the Nolan show (“we can’t, in statistical terms, look at the warming we’ve seen and say that it’s doing anything very different.”). Possibly it was a lack of preparedness which also led our Beloved Bishop to make some statements which when confronted by RichardB he now seem to recognise weren’t very defendable or not well-expressed. Why not have a climate scientist, an expert on mitigation and one on adaption (either academics or from industry). It’s not the experts and climate scientist that are politicising climate change its the media. I watched a Al Jazeera segment on climate change awhile ago that basically had three experts from differing climate fields and it was really informative with solutions and problems actually being discussed. It was a refreshing change from the usual denial whack-a-mole. I would add that “not knowing the figures” would be an extremely generous framiing. You don’t even have to know ‘”figures” to simply know whether there’s been warming, or not. I certainly know if I were staging a radio show to talk about climate change, the first expert I’d invite is one who doesn’t even know if there’s been warming or not. Prior to reading David Ropeik’s informative and thought-provoking article, I do not recall having been exposed to the psychology of risk perception. Correct me if I’m wrong, but I do not believe that you have heretofore addressed this important concept in an OP. Doom and gloom essays are more likely to offend skeptical readers than to convince them. Cognitive studies suggest there’s a better way. I didn’t really like that article. It’s the standard “scientists are engaging in deficit model thinking” which – to be quite honest – I find simplistic, and irritating. ATTP: OK, fair enough. Did you find Ropeik’s discussion of the psychology of risk perception to be informative?. Were you already familiar with the concept? Sure, the idea that we worry more about risks that feel personally threatening, than those that seem more distant makes sense. Also, it makes sense that we’re willing to take risks if there is some benefit. I just didn’t really see anything in the article that highlighted how we could use this to communicate more effectively (while still be honest about our scientific understanding). Look to Pete Buttagieg for tips on communicating on climate change. Speak of floods, not of storms. Speak of Arctic temperatures, not of global. Speak of rinderpest, not malaria. Speak of infrastructure, not of subsidy. ATTP: Thanks for the feedback. I’m an early donor to Pete, who is my darkhorse. I’ll warn him right away to steer completely clear of Tom Fuller. If Pete starts talking Fuller junk, I’ll cut him off. I forgot to issue a Lewandowski trigger warning. Certain individuals should seek a safe space before reading. If the interviews of Nebraskans I saw on a MSNBC news show this morning are indicative, the severe flooding event described in the article below has convinced a number of people residing in the impacted multi-state area that man-made climate change is real and is happening now.A goodly number of people simply have to experience something directly before they will accept what others have previously told them about it. In other words, black swan events will almost always trump communications. 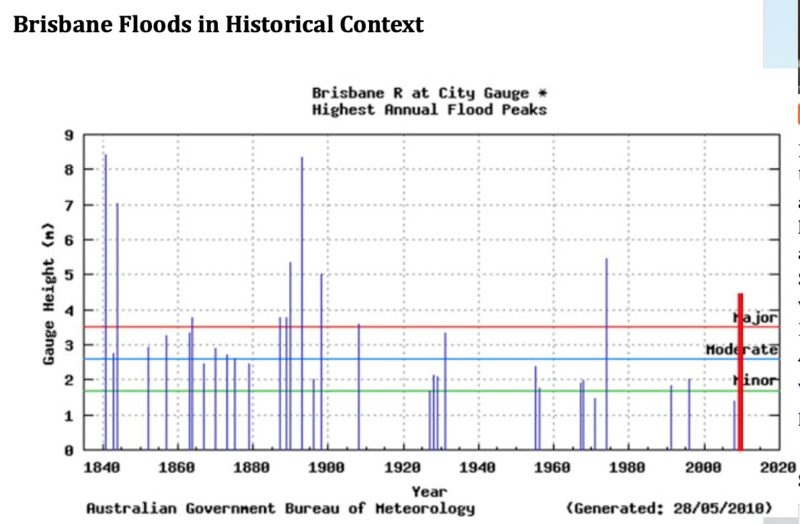 Cue the Pielke types to chime in that there was a worse Missouri River flood in 1936, or 1952, or whatever. Completely ignoring multiple major and minor dams have been built since then both on the Missouri River itself and its tributaries. They sell them to taxpayers as flood control devices. Willard: What we need are for more people to believe that the common good trumps the individual’s good. the severe flooding event described in the article below has convinced a number of people residing in the impacted multi-state area that man-made climate change is real and is happening now. i don’t think that is borne out in the research, JH. I am pretty sure that the research shows that victims of these climate-related disasters actually don’t change their minds much, and, in fact, believe that because it has happened to them/their community once, it is less likely to happen again. And, like with gun violence, there is a general truce declared about even mentioning the core issue in the immediate aftermath as the community comes together to help each other out. Especially if you interview them a few weeks after the event. Ironically, in going to grab the research on this, it is from Paul Slovic, who is the risk communication cited in the David Roepik article you linked to. I will see if I can find a device where I can copy and paste. But the research on the communities that are struck by these events don’t respond like that. According to the “psychology of risk” guys and gals, anyway. I remember this being amongst the most discouraging/frustrating things discussed in George Marshall’s “Don’t Even Think About It”. There are older/newer ones of course. By ‘so called’ Pielke types do you mean those that study flooding events, because the Pielkes, as far as I know, do not study flooding events or have a lick of SME status in that area. Those are the mission statements of FEMA, NOAA (NWS), USGS, USACE and USBR. Attribution is a rather dicey subject, given that in CONUS the flooding frequency is about 2-3 floods per year (so don’t listen to that Allstate commercial because with reasonable certainly at least one 500-year flood is occurring at any time somewhere in the world). It seems we all are supposed to tippy-toe around unskeptical “skeptics'” fragile feelings, for fear of offending them. Their fans, on the other hand, can lie, threaten death to hardworking scientists and their families (a guillotine for Dr. Hayhoe’s baby, one of many examples), and use every tactic known since Schopenhauer (“How to Win an Argument”, look it up, Rove has nothing on him, it’s not new) to “disprove” the obvious. Just remembered, reference: Collide-a-Scape. (Keith Kloor). It’s searchable if you want to know where I got my opinion: I read it all at the time. Wasn’t long after ClimateGate DDOS and RealClimate’s yeoman work providing comprehensive and polite information in default of enough sleep. In future I will simply assume you are a conduit for untrue statements rather than their originator. aTTP, yes, the Collide-a-Scape exchange followed on that. It went on and on … and on. He is a commentator on serious issues affecting policy. Who thinks it isn’t important to know whether or not it’s warmed to comment on climate change. Or doesn’t show accountability when he displays that lack of knowledge. But anyway, the point I was making is that providing “balance” on a subject is not necessarily the right thing to do, it depends on the evidence. And regardless as to what you think of Mountford’s views, the scientific community would regard them as outside of where reasonable scientific debate lies. So constantly offering his ilk as “balance” actually results in a totally skewed presentation of the facts. Is there any attempt to adjust the modern floods for mitigation measures. No time. Had to pollute the internet with a denial that climate change could be involved. That assertion is a negative, which as they say, can’t be proved, and which is implying that you guys are asserting that he is a crank, which puts the burden of evidence on you. Now there’s a nice clear assertion for which you should be able to supply some clear examples. Can you give me some that are “outside of where reasonable scientific debate lies”? On this side of the pond,very few people give a crap about what Montford has to say. He’s pretty much a has been. the point I was making is that providing “balance” on a subject is not necessarily the right thing to do, it depends on the evidence. do you not get, Canman. No need to be a crank to be unfit to speak as an authority on the Beeb. John Hartz, “has been” implies that there once WAS something substantial. I could concede that our Beloved Bishop once was good at stirring the purple pot. He went on the radio to talk about climate change, got the most basic of facts wrong (and characterized them in two completely different ways), and then indicated that it wasn’t important that wasn’t important to know the most basic of facts. In follow-up to an upstream discussion, here are three recent articles about the ongoing flooding event in Nebraska and surrounding states. All three are quite informative. Canman: Are you suggesting that Monckton will go down in history as a “never been”? Monckton a Never Been ? He is already immortalized in the rolls of the Worshipfull Comapny Of Broderers, and is name will live on for as long as his shirts are worn. And the damn things are going strong after 20 years ! Montford and Greta, juxtaposed, could be powerful TV.